There’s nothing like the feeling you get when you add that finishing touch to a quilt. The binding. This is the home stretch. The project is almost done! But what if the corners aren’t 90˚? For example, Scrap Book, has a unique corner treatment that takes away those familiar 90˚ corners. These steps help you bind any project with corners of any angle. Here’s how it works. My example is a simple place mat. I made the place mat rectangular shaped, with 90˚ corners, quilted it, then cut off about 3″ of each corner at a 45˚ angle. 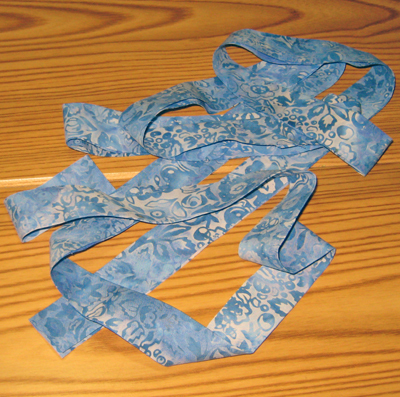 Start by making the binding. I like to cut enough 2-1/4″ width-of-fabric strips to go all the way around the project with a bit extra, then connect the strips with diagonal seams, and press in half lengthwise, wrong sides together. 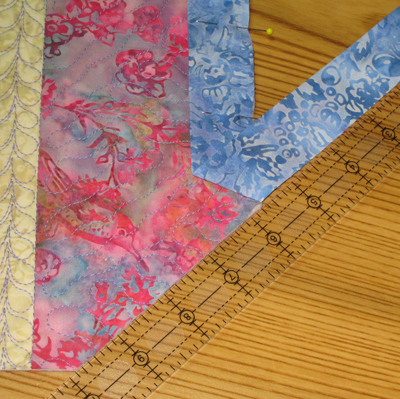 If you prefer making your strips a different size or on the bias, that’s fine too. Trim the batting and backing even with the quilt top. 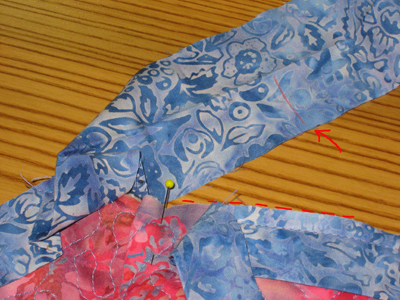 Then pin the binding to the first side of the quilt, leaving a 6-12″ tail at the beginning for the closure later. 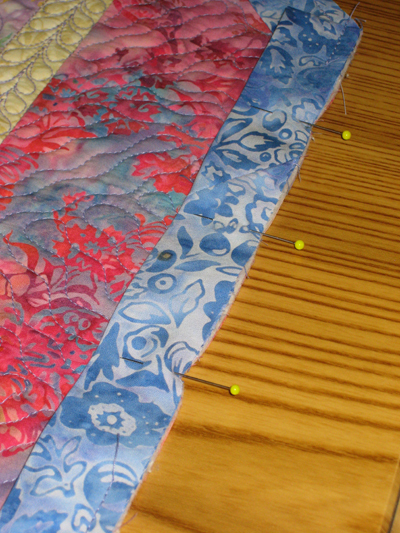 Pin the binding to the front of the quilt, with raw edges aligned, proceeding clockwise. 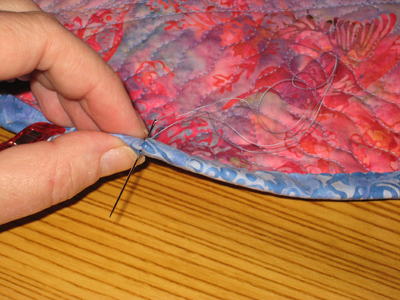 Before securing the first corner with pins, fold the binding backwards onto itself so the bottom edge of the next side of the quilt and the raw edge of the binding form a straight line. The ruler is to show the line. We’re not measuring anything at this point. At the fold, finger press the binding so you can see the fold line. Unfold the binding. 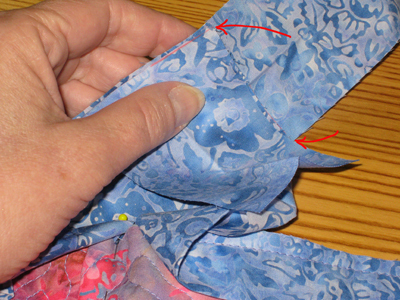 If you can’t see the fold, draw a short line (maybe 3/8″ long) from the raw edge of the binding. See the red mark? 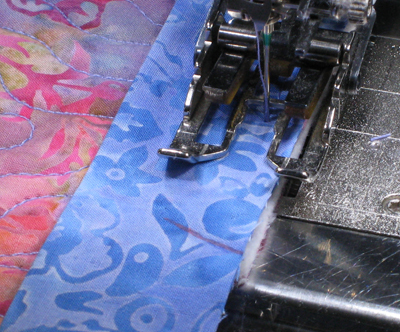 At the line, (sewing machine should be in needle-down option, if you have it), pivot the quilt, then sew on the line, or just a hair to the right of it. Just like before, fold the binding to the right of the corner, forming a straight line at the raw edges, then fold the binding back on top of itself, so the raw edges align. This time, you’ll have the seam (the one you made on top of the red line) in place to let you know you are in the right spot. Pin the binding to the quilt edge to secure it. Make your way all the way around the quilt. 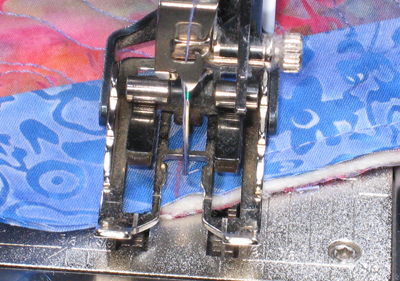 Leave a 6-12″ tail of binding on the last ‘straight-away’ side for a continuous binding closure. There are tons of methods to make a continuous binding closure. This method is my favorite. 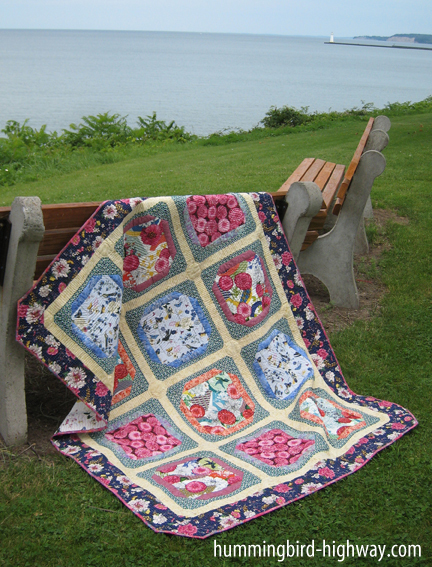 Start by laying the quilt flat on the work table. 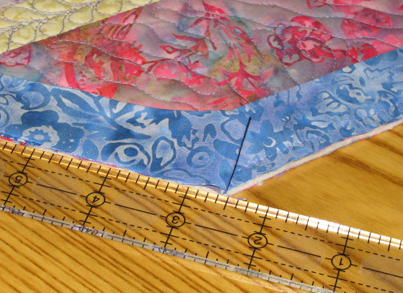 Arrange the binding ends and fold them so they lay flat on the quilt edge and ‘kiss.’ Divide the width of the binding strip by 2 (2-1/4″ divided by 2 equals 1-1/8″) Measure that distance away from the ‘kiss’ fold on each side, and draw a line on the binding (red, in my case). Next unfold the right binding tail and place it right sides together so that the edges of the binding strip align with the drawn lines as shown. It helps to fold the right binding tail back on itself so you can see the drawn line to be able to align it with the binding edge. 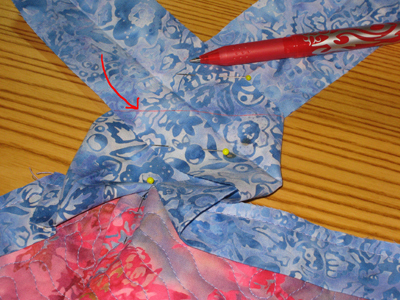 Open the fold so the binding ends make a big “X,” secure the binding intersection with a couple of pins and draw a straight line, parallel to the top quilt edge, connecting where the binding edges intersect. The arrow is pointing to my drawn red line. 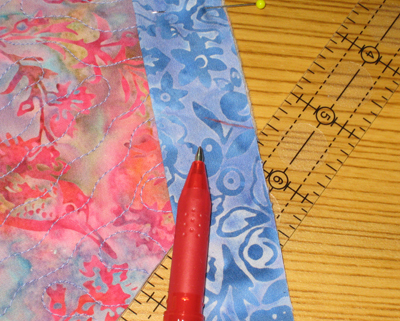 Sew on the line and trim 1/4″ away from the seam (the side of the seam that is farther away from the quilt edge). Finger press the binding seam open. 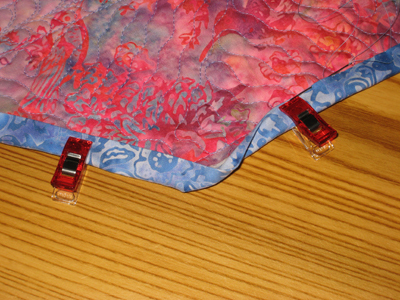 Remove all the pins, including the pin holding the squished quilt together. 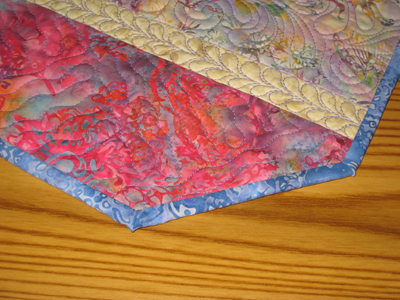 The binding should lay nice and flat against the last side of the quilt. 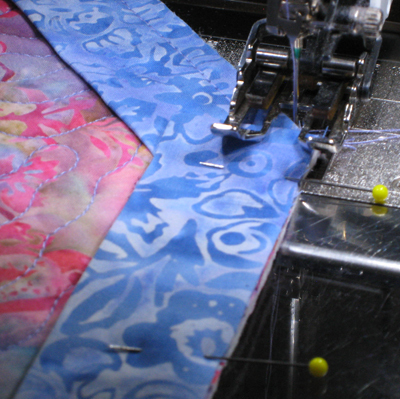 Finish the 1/4″ binding seam. Ta-(Almost)-Done! 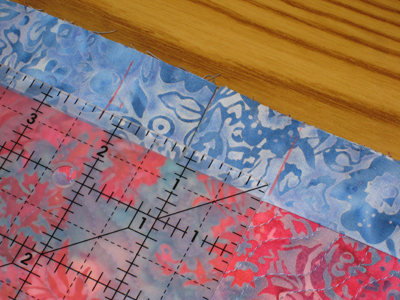 Now that the binding is attached, the folded edge needs to be secured to the back of the quilt. You can do this my machine or by hand. 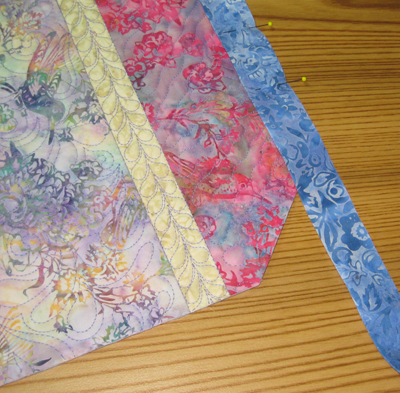 I like to sew the binding fold to the back of the quilt by hand. 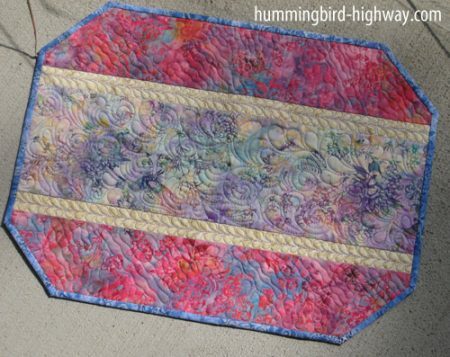 With the quilt facing back-side up, fold the folded edge of the binding from the front to the back, and start sewing the binding edge with a slip stitch on one of the straight-aways. 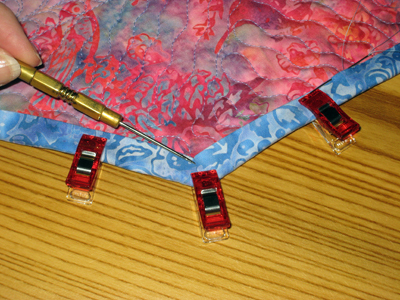 The Clover wonder clips are great for holding the binding in place while you sew! As you approach a corner, place a binding clip on each side of the corner about 2-3″ away. 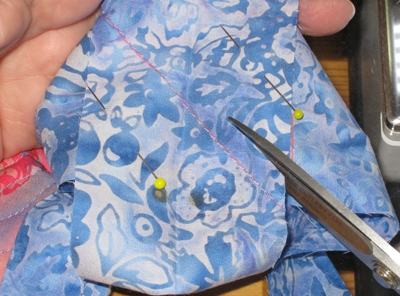 Park the needle, then with your fingers, flatten the left side of the binding to the corner. Then fold the right side of the binding over the left. 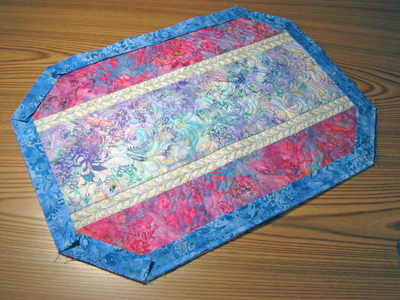 Adjust with your fingers until the folded edges intersect, . . .
. . . and the binding bulk on the top and the bottom of the quilt oppose. Sew to the corner, then travel into the corner with the needle and take a stitch from back to front, then from front to back to grab each miter fold. This helps keep your binding corners nice and crisp through lots of wear and tear.